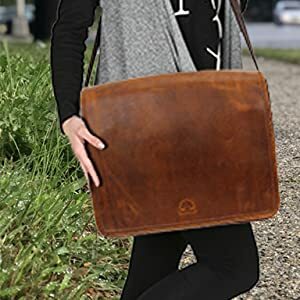 ✅ REAL RUGGED BUFFALO LEATHER… 100% genuine, not PU or faux but natural, beautiful & handmade; oil-rubbed & distressed, this satchel improves with age & smells just great! Ideal for 15-inch or smaller laptop, MacBook or any flat screen device. Can also additionally store files, books, mobile, tablet, laptop charger, etc. Made from pure buffalo leather. The leather is a natural material and may display variances in hue as well as other slight irregularities. We say no to “PU Leather” and only use the highest quality genuine leather. We master the smallest details and test every rivet, fastening, and material before we ship. Our in-house production leads to the best quality control and our customer obsession is unmatched. Each of our shoulder satchels is handmade and looks more beautiful the more you use it. Unlike machine-processed leather bags that can lack warmth and personality, Rustic Town products use traditional tools which create tiny imperfections that deepen with the character as they age. 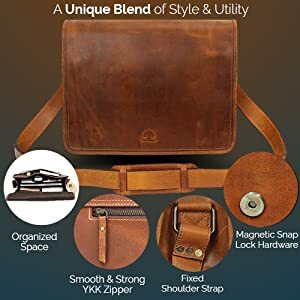 A Satchel looks great for business and casual wearing – adjustable shoulder strap comforts the journey the way you wish to carry cross shoulder or sideways. 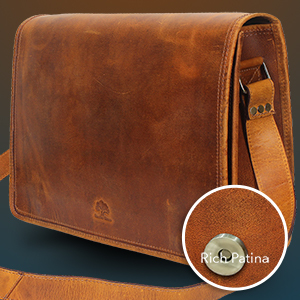 It is ideal as a college or office bag, best for casual or professional meetings. Commuting using a backpack has problems; you must take it off when you sit down, or when the queues get cramped. This shoulder Satchel simply slips around to your front or side. 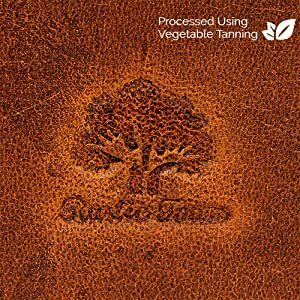 We wanted to stay clear of using harmful chemicals such as chrome and this is why the leather used in our bags and accessories is processed using the traditional technique of “vegetable tanning”. This gives our leather unique natural characteristics and is less harmful. It takes longer and costs us more, however, it is worth it.